After going to bed at half past 2 yesterday (on the 11th as this is written on the 12th) it was a pretty shattering experience hearing 14 sets of mobile alarms from 7 am to 8.30. I dragged my tush over to the breakfast feast that was awaiting in the canteen and drank about 14 cups of herbal tea. ‘Luckily’, day 4 was not so hectic and jammed with events. One lecture by post.doc. Henrik Jøker Bjerre on the philosophical thought’s problems with gender, and an historical overview of gender and feminisms from the 70’s to the 10’s by Mette Moestrup. And the day was finalized with an hour of singing from the folk high school songbook in the meeting hall. The lecture by Henrik Jøker Bjerre was intense and packed with ideas on the problem with thinking gender. He based his lecture on two main foci – that of Lacan‘s ‘Encore’ and Lilian Munk Rösing’s ‘Kønnets katekismus’. There was again as with Munk Rösing’s lecture a whole lot of Lacan’s idea of the Other – understood as when you define yourself by positioning yourself against the Other, and in doing so you risk excluding and subordinating the Other. In this case the man’s gaze upon the woman, inscribing her to specific traditional roles, both of religious, secular and biological forms. The critique is that instead of acknowledging the Other, you overlook the Other’s otherness, in order to inscribe onto the other your own desire and understanding of the Other as a way of gaining control. In the lacanian notion, you can never know yourself completely, and should never try to create gender in one’s own image. Bjerre criticized the notion of discussing gender problems either with using non-gender logic or a polarization of the two sexes, whereas he sees a possibility in recognizing the difference between genders – the Otherness of each other – as a way of transgressing the deep problematic function of inscribed and traditional gender roles. Moestrup’s lecture was interesting in the sense that I was introduced to a fascinating woman I had not heard of before: Hannah Wilke – a performance artist who used her body as a tool for her ‘message’. See more on her here. Maybe I was too tired at this point, but I couldn’t really sink into the lecture she gave, but she spoke a lot about the lies which we reproduce over and over again about gender and it was also here that I became aware of Cixous who wrote ‘The laugh of Medusa’ which is now officially on my ‘to read after seminar’-list. 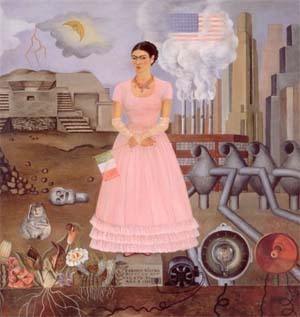 The introduction to Wilke coupled with the lecture about queering by Dag Heede made me think of another female artist, whom I am fascinated by; namely Frida Kahlo. It was especially when Moestrup talked about female artists and the question of historical hierarchisation between the sexes, where woman is object/form and man is subject/artist. 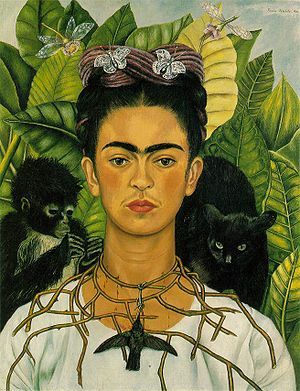 Because what sometimes happens when woman decides to be artist; she uses herself and thus becomes both subject and object. 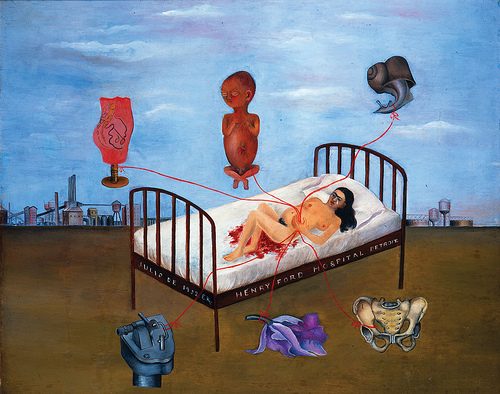 This is true of Frida Kahlo, who spent most of her time portraying herself in various situations – situations, that were both painful (as the painting of her in a hospital bed after a recent abortion), and mysterious (where she combines nationality, her Mexican heritage, in with the political ideology and gender). 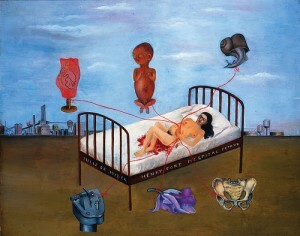 Below are a couple of her paintings. In the evening a bunch of us met in the lecture hall and sang songs from the folk high school songbook, which was very cozy although I hardly knew the songs we were singing. It didn’t matter, because I started to get a nostalgic feeling towards my time at my ‘ungdomshøjskole’ that I spent half a year at, way back in 1999. Songs are a very strong traditions at folk high schools, the whole ritual of singing is well embedded in everyday life. And it was so weird because the head of this school reminded me so much of my old headmaster where I was, somehow it’s the folk high school way.